There is a stillness about Easter Eve. Whether you are Christian, hold another faith, or none, the underlying archetypes of the Easter journey are common to all human experience. We have all, unless we have led a supremely charmed life, been cast out into the wilderness at one time or another. Life has crucified us all, to a greater or lesser extent. We have been in the Underworld, have known what it is like to go through experiences so severe that we die to our old selves. 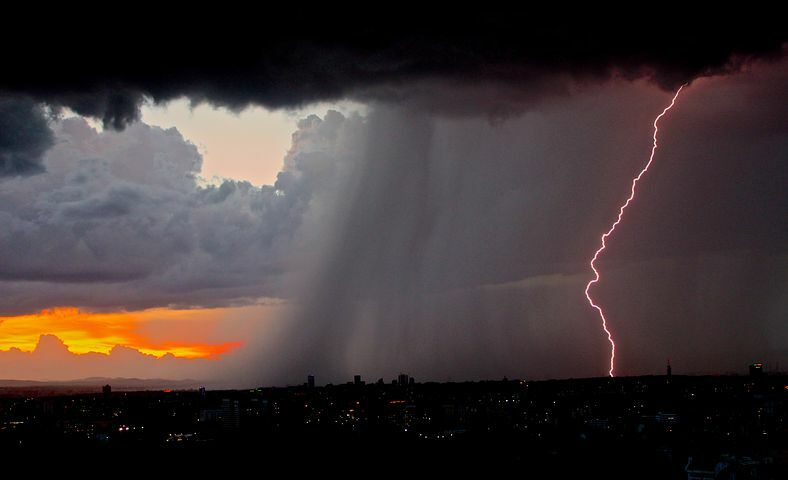 Then there is the wait, the wait in darkness, fear, and not knowing. Will we ever emerge, reborn? And when we do emerge, who are we now? Who recognises us, acknowledges and honours where we have been? And the most profound question of all: what should we do with the life which has been given back to us? I remember my first encounter with astrology vividly. It was my first year in Egypt and we lived in a tall, white villa surrounded by a garden filled with fruit trees and crab grass. The house, at least in my memory, was vast, with cold tile floors and ceilings so high they vanished into shadows. The centre of that house was a void around which wound four long flights of stairs. This void kept the house cool in summer — and freezing in winter. At night, those stairs creaked and groaned. Maybe it was the dry heat, or maybe it was the ghosts. My mother said it was the hedgehog, which we’d been given as a pet by a neighbour, the tick expert, and which had escaped to live a solitary life in the house — allegedly. My parents filled this echoing house, and perhaps their echoing marriage, with other people. This motley, colourful bunch drifted in and out: houseguests, lunch guests, dinner guests, neighbours, the cook Hafez, a very devout sewing lady, an Irish poet, a drunken archeologist, hippy converts swathed in hijab, Chickie the cat lady from across the street, and Margo, the artist who lived round the corner and used our top floor as a studio when she got fed up with her own. Among the many visitors to the house were my father’s students from the university, who, in those days, were probably not much younger than him. They hung around perching on the edges of chairs, impeccable children of the wealthy, with Chanel handbags and perfect hair, round-eyed, slightly uncomfortable. A Greek boy called Costa Benakis became infatuated with my cousin Judi, a genuine English peach-bomb draped in Biba — one of the many houseguests. Costa hung around a lot: black hair, white flares, sunglasses, car keys and silver worry beads. At the age of six, I found him utterly delightful. At the age of 18, so did my cousin. Anyway, one day, Costa, possibly in an attempt to ingratiate himself with the household via its youngest member, explained to me that I was a Pisces, because my birthday was March 1, and so was he because he was born just a few days earlier. The strange energy in that house — fervid, disrupted— fell away like a dark, retreating sea. And there I was at a still, bright point, listening intently. In that sharp, luminous moment, astrology arrived in my mind, and, I think my trembling, small soul unfurled a little. I was not just a little girl in a troubling sea of stumbling adults, I was a Pisces, a mermaid, a starchild, a creature of myth. I couldn’t put it into words then, of course, but I think I understood instantly that I was a part of a magic, invisible web. I am not sure of the exact date, but it was close to my birthday, and that year my solar return was indeed special. I have only just drawn it up now. What I did not know then is that this web of light would catch me again and again as I too stumbled through troubled life. Mercury, the ancient planet associated with astrologers, is rising in the solar return chart, and it sits on my own Mars-Mercury conjunction. This is also exactly on the cusp of my 8th house, the house of esoteric studies. Jupiter is exactly on my natal Venus in Aquarius, which I’ve always associated with my love of astrology. You might look to Uranus also, the modern planet associated with astrology, and there he sits making a perfect trine to my Moon-Jupiter conjunction in inquisitive, curious Gemini. Indeed, my soul was awakened. You might also conjecture whether the household in which I lived that year was particularly eccentric. Saturn is also applying to the natal Moon-Jupiter conjunction — a life-long commitment was coming. In fact, I was also quite unwell later in that year, when Saturn reached the moon. It was the beginning of many years of physical frailty, which turned me towards an inner world and helped make me a dream-spinner, fiction-lover, art-junkie. But when we moved out of that house, co-incidence or not, I lost astrology for a decade. There is a time for things — and there is also a place. It was not until I was in my 20s, in London, that astrology came back to me. My friend Giselle — a kind, angry woman with big, bleached hair and squeaking leather trousers — recommended a book to me when I was in those fearsome doldrums that strike in your 20s. In fact, once again I was living in a tall, white house full of ghosts. The book was called Saturn: A New Look At An Old Devil. Liz Greene’s book arrived in my hands some years before my Saturn Return. Greene’s writing electrified me. So, you could be an astrologer and intellectually rigorous too? She opened a door in my mind that’s never been closed. I’ve just looked at her chart too. Her Uranus — the Awakener, the Astrologer — is right on that same Moon-Jupiter conjunction in Gemini that was being trined when I was six, and it’s trined by her Jupiter in Libra. From there I made my way through Parker’s Astrology, the Astrological Lodge, and every astrology book I could lay my hands on, and eventually I wound up at a lecture by Liz Greene herself when she taught at the Centre for Psychological Astrology. Uranus was back to trining my Moon-Jupiter from Aquarius by then, Saturn was back in Gemini — it was time for me to make a proper commitment to astrology. Since then, it’s the only job I’ve had, I’ve become a spinner of light to catch others before they fall. 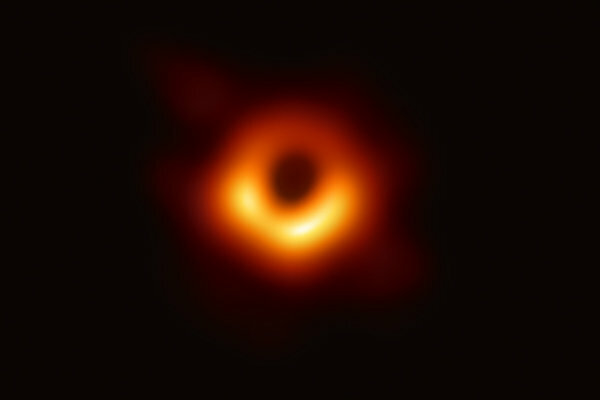 Today, the 10th of April, 2019, that something really special was a giant leap forward in our understanding of our magnificent cosmos: the first ever image of a black hole, from the galaxy Messier 87. The astrology of this event is stunning, as you see from the horoscope here, set for the time the updated image was released to the public from Washington DC this morning. There is much to be commented on in this remarkable chart, but I will confine myself for now to the major factors which leapt out on first sight. 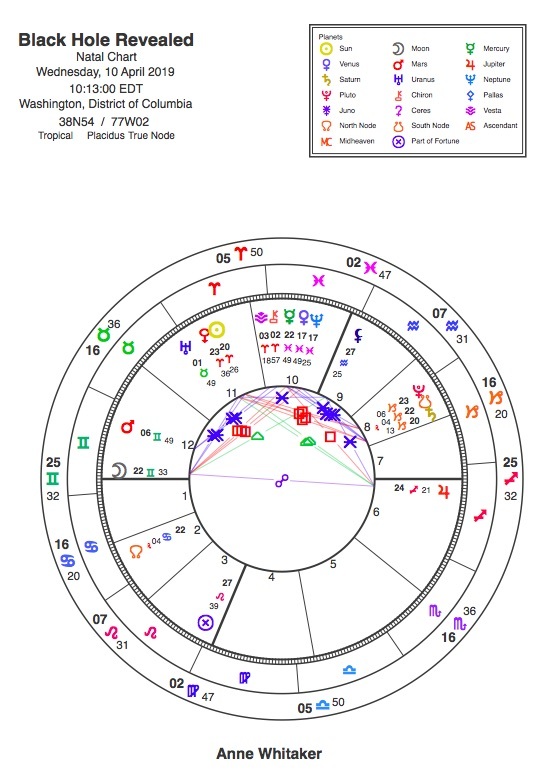 Furthermore, the chart’s ruling planet Mercury in the tenth house conjoins today’s beautiful, ethereal Venus /Neptune conjunction – with Neptune ruling the horoscope’s Pisces Midheaven, this line-up forming another T-Square with the Moon/Asc/Jupiter/Desc pattern. I associate Pisces here on the MC, and its co-rulers Jupiter and Neptune, with our ancient human yearning to connect with those only dimly understood great forces of the universe which have held us in awe and stimulated our need to explore the farthest regions of both inner and outer space since the very beginning of human culture all those millennia ago. our first ever actual picture of one of the cosmos’ most powerful, destructive and mysterious objects: a Black Hole.